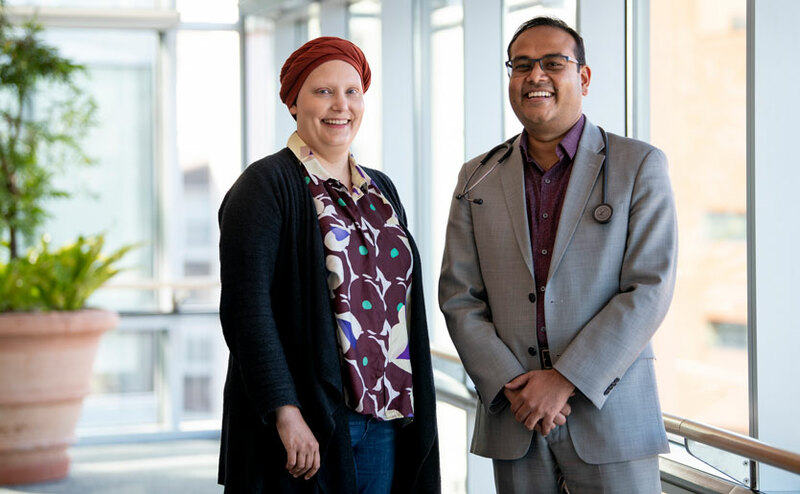 Since enrolling in a clinical drug trial led by Aditya Bardia, MD, MPH (right), Caroline Moore-Kochlacs’ cancer has stopped progressing for more than two years. Caroline Moore-Kochlacs was a doctoral student studying neuroscience — and only 31 — when she learned she had metastatic breast cancer that had already spread to her liver and bones. After several treatment attempts, her cancer had progressed again. Seeking access to clinical trials, she came to the Massachusetts General Hospital Cancer Center where she was matched with an appropriate research study of a new treatment. An investigational drug, sacituzumab govitecan, has kept her cancer from progressing for more than two years. These so-called “antibody-drug conjugates” are potent anti-cancer drugs because the antibody in them, like a key, locates and binds to a “lock” antigen that is concentrated on tumors. Unlocked, the drug can release high doses of chemotherapy drugs directly into the tumor. In contrast, traditional chemotherapy doesn’t just target cancer cells, resulting in considerable off-target toxicity. Dr. Bardia led clinical trials that have established the safety, optimal dose and effectiveness of the drug. As recently reported in the New England Journal of Medicine, the researchers saw a significant response in women whose triple negative breast cancer had previously not responded to any treatments. About 10-20 percent of breast cancers are triple negative, so-called because it is not fueled by female hormones estrogen or progesterone, nor by the HER2 gene. It is a particularly aggressive form of breast cancer that tends to disproportionally affect young women and African Americans. The drug substantially reduced the tumors in 33 percent of these patients and stopped them from growing in close to half the patients. The Food and Drug Administration (FDA) has designated sacituzumab govitecan a “breakthrough therapy” for triple negative breast cancer. A drug for life-threatening conditions can be deemed a breakthrough therapy if preliminary clinical data indicate it is a substantial improvement over current therapies. Dr. Bardia now leads an expanded international clinical trial with sacituzumab govitecan and his team is also developing the drug for women with other subtypes of metastatic breast cancer. For the past two and a half years, Dr. Moore-Kochlacs has come in for treatment on Thursdays and then spent Friday and the weekend recovering on the couch with nausea and fatigue. Though the side effects knock her out for a couple days, she says she was relieved how much easier they’ve been than with previous treatments. She’s been able to work part time and was married in 2017 to Austin Soplata, who was in the same neurosciences doctoral program at Boston University as she. They had just moved in together when she was diagnosed in 2015. Her support network also includes friends from her book club and grad program. They take turns helping her out on weekends. She is extremely grateful but realistic. “I want the treatment that will keep me alive until the next new treatment comes along,” she says. Building on their success, the researchers are evaluating whether the effectiveness of sacituzumab govitecan could be further improved by combining it with other targeted therapies for patients with metastatic breast cancer. In certain women, Dr. Bardia believes it could potentially be used earlier in the disease to prevent metastatic disease. For more information on how to support precision medicine and metastatic breast cancer research at the Mass General Cancer Center, please contact us.